Stock #sPLS101ms :Platinum! 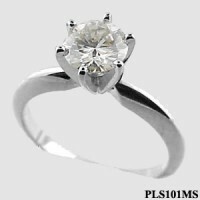 6-prong Tiffany style Solitaire Ring. Top quality die-struck mounting... Assembled, set, & sized to order, takes 2-5 days. Other sizes available by special order.